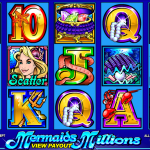 If you’re a long time Microgaming fan the chances are you have played Mermaids Millions at least once in some online casino. This used to be a very popular slot across Microgaming casinos before the new modern video slots took over. The reason was simple. The slot has a strong pay table and attractive bonus features which can produce big payouts. If you compare Mermaid Millions to a modern video slot game in terms of visual effects you will see that it doesn’t have a lot to offer. The animations are very low and the symbols have a simple design. Still the bonus features are much more attractive and make up for the simple look. The wild symbol in the slot is Poseidon and he will substitute for all other symbols except the Mermaid Scatter and the Treasure Bonus symbol. He also comes with a hefty 7.500 coins payout for 5 of a kind wins. Once 3, 4 or 5 Mermaids land anywhere on the reels the free spins bonus is triggered. Players will be awarded with 10 free spins where all payouts will be tripled in size. The free spins can be re-triggered with 3 or more Mermaids on the reels. 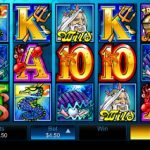 Mermaid Millions also has a cash pick and win bonus which is triggered with 3, 4 or 5 Treasure Chest symbols on an active pay line. You will be presented with 12 Treasure Chests and you will need to pick 3, 4 or 5, depending on the number of triggering symbols. You can win up to 2.500 coins in this feature. There you have it, an old but still attractive video slot by Microgaming software. Mermaid Millions is still a popular slot among Microgaming nostalgias, since the bonus features can pay nicely thanks to the rich pay table. If you want to see how far the rabbit hole goes then you should consider playing Mad Hatters a 5 reel slot by MicroGaming.